Adiantum capillus-veneris L. is one of the best ferns that are used in traditional medicine for breaking kidney stones. This study aimed to evaluate antioxidant activity of the different extracts of A. capillus-veneris using the phosphomolybdenum assay, free radical scavenging activity (DPPH), ferric reducing antioxidant power (FRAP), and cupric ion reducing power activity test (CUPRAC). Besides, the enzyme inhibition activities were determined against acetylcholinesterase, tyrosinase, α-glucosidase and α-amylase. Total and individual phenolic compounds were also determined by spectrophotometric and HPLC methods, respectively. Total phenolic and flavonoid contents were found to change between 354-441 mg GAE/g and 23-123 mg QE/g, respectively. The major phenolic compounds were benzoic acid, epicatechin, syringic acid and catechin. Methanol and ethyl acetate extracts exhibited stronger antioxidant abilities compared to water extract. A. capillus-veneris extracts showed high enzyme inhibition activities except for butrylcholinesterase. The results indicated that the different extracts of A. capillus-veneris L. can be used as natural sources of antioxidants and enzyme inhibitors. Keywords: Adiantum capillus-veneris L., biological activities, diabetes, Alzheimer, skin disorders, Diabetes Mellitus. Keywords:Adiantum capillus-veneris L., biological activities, diabetes, Alzheimer, skin disorders, Diabetes Mellitus. Abstract:Adiantum capillus-veneris L. is one of the best ferns that are used in traditional medicine for breaking kidney stones. This study aimed to evaluate antioxidant activity of the different extracts of A. capillus-veneris using the phosphomolybdenum assay, free radical scavenging activity (DPPH), ferric reducing antioxidant power (FRAP), and cupric ion reducing power activity test (CUPRAC). Besides, the enzyme inhibition activities were determined against acetylcholinesterase, tyrosinase, α-glucosidase and α-amylase. Total and individual phenolic compounds were also determined by spectrophotometric and HPLC methods, respectively. Total phenolic and flavonoid contents were found to change between 354-441 mg GAE/g and 23-123 mg QE/g, respectively. The major phenolic compounds were benzoic acid, epicatechin, syringic acid and catechin. Methanol and ethyl acetate extracts exhibited stronger antioxidant abilities compared to water extract. A. capillus-veneris extracts showed high enzyme inhibition activities except for butrylcholinesterase. 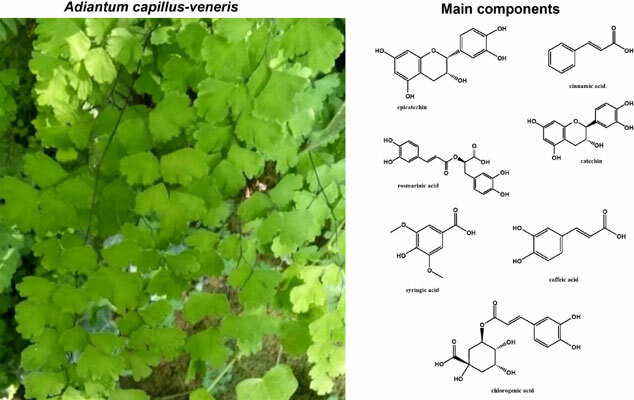 The results indicated that the different extracts of A. capillus-veneris L. can be used as natural sources of antioxidants and enzyme inhibitors.